The American reality television show “Shark Tank” is an international hit, and it has existed in some form since as early as 2001. 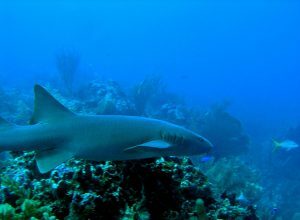 In San Pedro, Ambergris Caye, this same concept was implemented to create the Belize Shark Tank investment event. The event, hosted by Caye International Bank, is designed to bring attention to Belize’s private sector and the important role these small and medium-sized businesses play within the local community. To enter the event, startups and entrepreneurs submit their business proposals for consideration. These submissions are vetted, and the best projects are selected and presented before the panel of “sharks” and investors. The previous Shark Tank investment event showcased exceptionally innovative products and services. It was a remarkable success and this year’s event is on pace to be the biggest one yet. This year’s Shark Tank event hopes to attract many of Belize’s young entrepreneurs and startup companies. All Belize media companies are openly invited to come and witness the show, as these individuals compete and present their ideas before a panel of investors and celebrity judges for the grand total prize of BZD $10,000. By highlighting these local businesses, more sales and money can be redirected back into the local region. For small businesses in Belize, just participating in the Shark Tank investment event can offer incredible marketing and advertising benefits. The official panel of sharks will be announced shortly, and the deadline for entry submission is on the 26th of March. For further information about the Shark Tank event hosted in April, please contact Hazel Gutierrez by email: hgutierrez@cayebank.bz or phone: 501-226-2388. Events like Belize’s Shark Tank are an effective way of boosting the local economy, encouraging investment, and bringing the community together. This event is organized by Caye International Bank in Ambergris Caye. Whether you’re living in Belize or thinking about investing here, an account through Caye International Bank can help you achieve your financial goals. Contact Caye International Bank today to begin your path to financial security. This entry was posted on Tuesday, March 6th, 2018 at 10:56 am	and is filed under Company News. You can follow any responses to this entry through the RSS 2.0 feed. You can leave a response, or trackback from your own site.